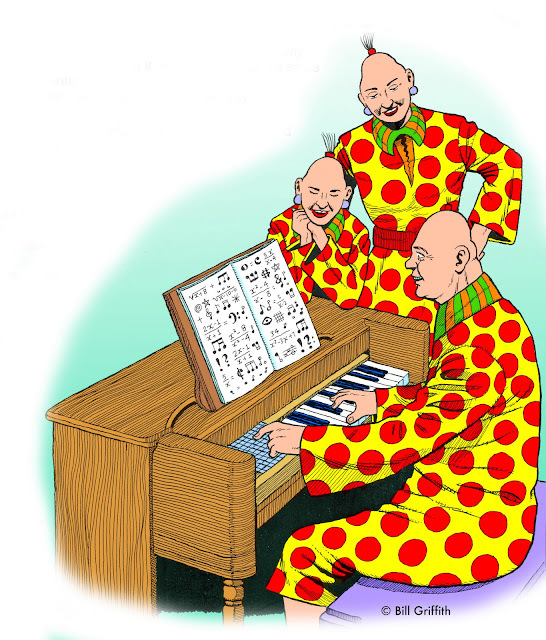 “Even if you’ve never had a piano lesson in your life…” Illustrated by Bill Griffith! Bill Griffith's "Musical Pins" inspired not just one queron but a second as footnotes. it up with shipping—without leaving your post. Then videocapture with all your being! Saturday Night Sing-a-longs—teens thing they’re tops! Mom puts out a plate of garbanzo crescents. Dad plugs in the home fog machine and flash pots. Suddenly you’re three of the many Osmonds. so we gather around the keyboard console. His face opens up—such a sweet audience. the F’tang F’tang Olé Biscuit Barrel. you could have watched musical numbers by The Osmond Family. comics (sequential art), and so on. To create is to copy. Obscure reference in art predates even modernist Ezra Pound. so I painted it in an amateur pointallist circus style. Years later, I went gaga over Griffith’s surreal comic strip. I sent Bill my painting, and he inked on the Pinhead—what a guy! leaving no one with a framed answer, but somebody with a smile. More credits: The Bone Doctor playing "Beer Barrel Polka" and daughter Mirabai on the Tiki Room Song.